President-elect Donald Trump's pick to lead the sprawling Transportation Department made $1.2 million while overseeing Wells Fargo as a director during the period the bank has admitted to creating millions of fake accounts. 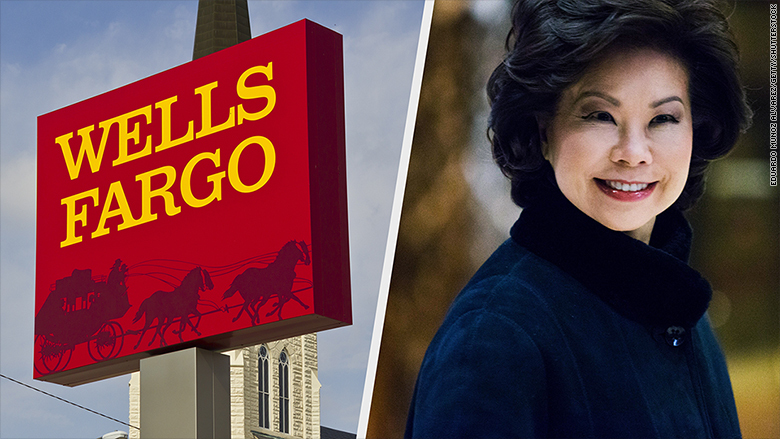 As a member of Wells Fargo (WFC)'s board since 2011, Elaine Chao was responsible for monitoring the bank's actions as well as hiring and firing management. Chao recently informed Wells Fargo she will resign from the board of directors "if and when" she is confirmed as transportation secretary. Wells Fargo said her decision is not linked to "any disagreement" with the company or anything related to its "operations, policies or practices." Chao's job on the board has been lucrative. She made at least $1.2 million in total compensation, including stock awards, between 2011 and 2015, according to a CNNMoney review of filings. Her compensation for this year has not yet been released. Besides Wells Fargo, Chao is a director of three other major companies: Rupert Murdoch's News Corp (NWSA), Ingersoll-Rand (IR) and Vulcan Materials (VMC). Last year alone, Chao made a combined $784,000 in total compensation from these directorships, filings show. Steve Sanger, Wells Fargo's newly-installed chairman, told CNNMoney in a statement that Chao has "provided sound guidance and oversight" and has been "deeply involved in the Board's efforts to address and remedy retail sales practice issues." Chao did not respond to requests for comment. In her first year, Chao sat on Wells Fargo's corporate responsibility committee, which is charged with monitoring the company's "reputation and relationships with external stakeholders (including customers)," according to a filing. Chao was a member of that committee only during her first year. She is currently a member of the board's finance and credit committees. Wells Fargo's reputation has been hammered amid the fake account firestorm. Mike Mayo, a veteran bank analyst, called Wells Fargo's handling of the situation "epic crisis mismanagement." The scandal has forced Chao and her colleagues on the Wells Fargo board to make changes, including clawing back $41 million from longtime CEO John Stumpf and launching an independent investigation. Wells Fargo's board also promoted veteran exec Tim Sloan to replace Stumpf after he abruptly retired amid the controversy. Jeffrey Sonnenfeld, a Yale professor and an authority on corporate governance, said he is "pleased that the board -- a bit late -- did take the wise path of an objective outside investigation." Sonnenfeld said he believes the investigation will "reveal that the board did not have the complete picture until very late in the process." Wells Fargo's reputation has also been hurt by horror stories from former employees who say the bank retaliated against them for speaking up about illegal activity. The bank has since apologized for its behavior and ushered in a series of changes, including scrapping unrealistic sales goals that employees said led to fraud. Warren Buffett, whose Berkshire Hathaway (BRKA) is Wells Fargo's biggest shareholder, recently knocked the bank for the sales goals. "It was a dumb incentive system," Buffett told CNN's Poppy Harlow. He said Wells Fargo made a "terrible mistake" by keeping in place sales goals that "corrupted people."